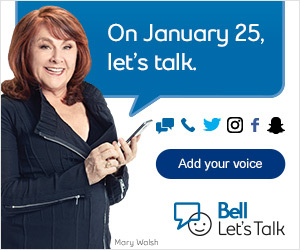 On January 25th, 2017, Bell will donate 5 cents towards mental health initiatives in Canada for every text, call, tweet, Instagram post, Facebook video view and Snapchat geofilter. Be sure to include #BellLetsTalk in your Twitter and Instagram messages . Let’s make 2017 the best Bell Let’s Talk Day yet. Every interaction counts! This entry was posted in Announcement, Event, Mental Health and tagged #BellLetsTalk, get involved, mental health, social media. Bookmark the permalink.